Two copies of Sports Illustrated for Kids All Access came in the mail. One for Reed and another for one of you. Reed and his daddy went NUTS looking at behind-the-scenes photos and reading behind-the-scenes reports about the places, players and stories in sports. (Tessa and I peeked over their shoulders once or twice, but were not quite as gripped by seeing behind the Green Monster or how Staples Center is switched from a hockey rink to a basketball court in 4 hours). 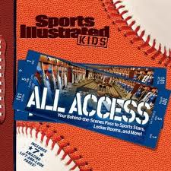 (Fall, 2010), New York, NY – The editors of Sports Illustrated Kids present Sports Illustrated Kids: All Access (Sports Illustrated Kids; October 26, 2010; $19.95), your pass to behind-the-scenes photos of athletes, locker rooms and more. Most fans experience sports from afar, but Sports Illustrated Kids gives you an All Access pass to the world of sports. In All Access, readers can unveil details by lifting up clear layers of acetate and go places they haven’t been. With over 50 photos, the 48-page hardcover book offers readers an up-close look at the coolest items, people and places in sports. Divided into three sections, Athletes, Places and Gear, All Access gets up-close and personal with your favorite athletes, gives you an all-access tour to the best places in sports, and offers readers an inside look into the cool gear that helps athletes do their jobs. High Five! How does your hand measure up to Shaquille O'Neal’s? From creepy crawlers to furry rascals, which sports stars have some of the most exotic pet friends? Food for thought. Take a look at the food inside Grant Hill’s refrigerator. What’s behind the doors of an NFL locker room? Get an insider view of the New York Mets’ first-class facilities. From face-off to tip-off, an inside look at the Staples Center’s speedy changeover. What lies within Fenway Park’s Green Monster? What does the inside of a baseball look like? Packed with exciting photos from Sports Illustrated and fascinating trivia, this hands-on book is guaranteed to entertain sports fans of all ages. The book is currently $13.57 at Amazon. I've got a copy to give away and I'll ship to a US address. Please leave a comment below telling me which of these revelations appeals to you most. Entries will be taken through November 9. Make sure I have your email address in the event random.org selects your number. Juli, you win -- congratulations!